Methods: The EndoFLIP™ balloon catheters used for this study allow 16 diameter measurements spaced 3mm apart along the axis of the catheter to be measured at the one time and in real time. The initial prototype balloons are specified for diameter measurements up to 25mm, the upper diameter being chosen to suit measurements made in the gastroesophageal junction for assessment of distensibility of the junction, or for assessment of GEJ diameter pre-,post- or during GERD surgery. Bench testing was carried out using calibrated rigid cylinders with the following diameters (mm) : 5,6,7,8,9,10,12,14,16,18,20,22,26 . The testing was conducted using 3 different prototype systems, with 10 different catheters and two different temperatures (23 and 37C). With 16 diameter measurements per catheter, this resulted in a sample size of 13,440 diameter measurements. Results: In rigid cylinder testing, the the median difference between measured and actual diameter was 0.1 mm (IQR -0.25 to 0.5) or 0.88% (IQR -2.38% to 3.44%). 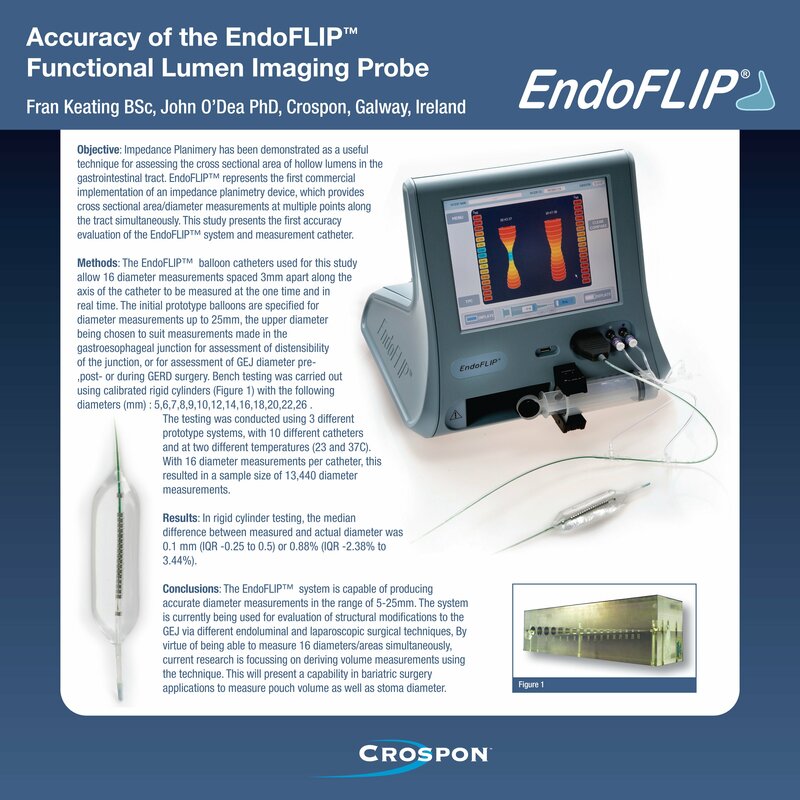 Conclusions: The EndoFLIP™ system is capable of producing accurate diameter measurements in the range of 5-25mm. The system is currently being used for evaluation of structural modifications to the GEJ via different endoluminal and laparoscopic surgical techniques, By virtue of being able to measure 16 diameters/areas simultaneously, current research is focussing on deriving volume measurements using the technique. This will present a capability in bariatric surgery applications to measure pouch volume as well as stoma diameter.